Eastern Redcedar is the most rapidly expanding woody plant species in the Great Plains and is now recognized as the number one threat to Nebraska’s rangelands by the Nebraska Conservation Roundtable. The impacts of redcedar invasion in grasslands are wide-ranging, including reducing grassland bird diversity and abundance, decreasing livestock production by 75%, reducing small mammal and insect diversity, and costing Nebraska Public Schools over $2,440,000 from 2006-2016. 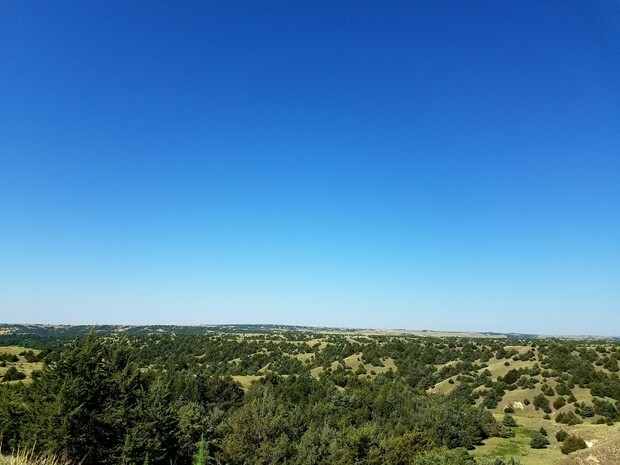 The objective of this grant is to assess the vulnerability of Nebraska’s grasslands to redcedar invasion, and develop predictive tools that enhance the potential to implement landscape interventions that (1) prevent the spread of redcedar trees or (2) restore degraded wildlife habitat following transformation to a redcedar-dominated state. Victoria M. Donovan, Jessica L. Burnett, Christine H. Bielski, Hannah E. Birgé, Rebecca Bevans, Dirac Twidwell, Craig R. Allen. 2018. Patterns of woody encroachment from native tree plantings in a temperate grassland. Ecology and Evolution: in press.